Every region across the fruited plain seems to have its iconic foods–incomparable dishes that define the area because they’re prepared better in that region than anywhere else. Though there may be many capable practitioners in the preparation of these beloved and celebrated regional favorites, invariably there are restaurants with legitimate claims to superiority–stand-outs which, by virtue of consistent excellence over time, have earned acclaim from savvy locals and pundits. When these paragons of mastery in the iconic cuisine are in close proximity to one another, spirited disputes generally ensue among locals as to which restaurant’s rendition truly reigns above all others. The City of Brotherly Love, for example, becomes a dysfunctional family when proponents of its eponymous Philly Cheesesteak sandwich get together to debate the supremacy of either Pat’s King of Steaks or Geno’s. To a lesser and certainly more civil extent, New Mexicans will dispute who makes the better green chile cheeseburger–the venerable Owl Cafe or the relative upstart, Manny’s Buckhorn Tavern. The premise of the Travel Channel’s Food Wars program is to settle rivalries among those most celebrated of local favorites, pitting “the nation’s most famous culinary rivals against one another for a final showdown, where a blind taste test will settle the debate:Who makes the Best Dish in Town.” Food Wars debuted in 2010 to much acclaim. The show is hosted by the effusive and entertaining Camille Ford, the Travel Channel’s answer to Rachael Ray, the kitchen diva on the Food Network. On April 6th, the Travel Channel’s Food Wars program visited Tucson to settle a long-standing dispute and determine, once and for all, which of its two most famous purveyors prepare the most celebrated and iconic food in the city, the Sonoran-style hot dog. This food fracas pitted El Guero Canelo against BK Carne Asada & Hot Dogs. The former is a claimant to being the original purveyor of the Sonoran hot dog in Tucson while the latter has innovated the concept with delicious variations on the traditional. 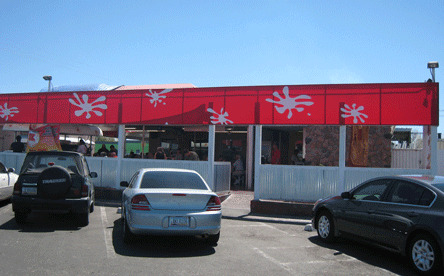 Both El Guero Canelo and BK are situated in Tucson’s famous “Eat Street” within a quarter-mile of one another on Twelfth Street. You can literally cross the street and walk a couple of hundred yards from one to the other. 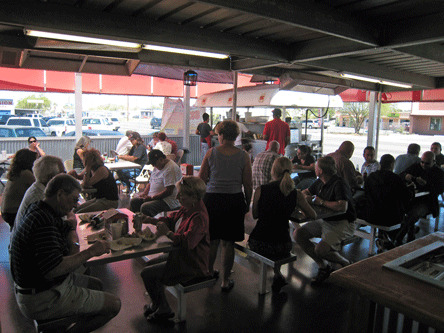 The Eat Street neighborhood and Tucson are divided as to which is best. Though both have earned “best Sonoran hot dog” honors from Tucson Weekly, in recent years El Guero Canelo, the elder statesman by two years, has dominated the award. The Food Wars format calls for blind taste tests in which an odd number (five) of judges taste each of the fabled foods and votes on their favorite. Two of the judges are “superfans,” one for each of the two restaurants competing. Ostensibly these superfans are so loyal to and so intimately familiar with their favorite restaurant that they can easily recognize its product even when temporarily deprived of sight. For the Tucson Food Wars, the judges were a restaurant critic for Tucson Weekly, an anchor from a local television station and a former NFL football player. The superfans were actually brothers, the younger so loyal to BK Carne Asada & Hot Dogs that he carries a picture of a Sonoran hot dog from his favorite hotdoguero (a term describing Sonoran hot dog vendors), but his wallet doesn’t include a picture of his girlfriend. The older brother declared his unwavering loyalty to El Guero Canelo. Neither conceded much merit in the other’s preference, both adamant that their favorite would prevail. When the grill smoke cleared, the former NFL player and the television anchor declared their preference for BK Carne Asada & Hot Dogs while the restaurant critic for Tucson Weekly (the only female judge) preferred El Guero Canelo’s dog. With the tally two to one in favor of BK’s, the most dramatic and surprising moment in the show’s young history occurred. Both superfans preferred BK’s. You can well imagine the older brother will never live it down that he couldn’t recognize his favorite Sonoran hot dog when blindfolded. A number of rabid fans from both camps cheered on their favorite and appeared to have a great time watching the process. The episode showcased the difference between the two Sonoran hot dogs. El Guero Canelo prides itself on staying true to tradition while BK’s has taken liberties with the condiments. The recipe for BK’s award winning Sonoran hot dog, by the way, can be found on my friend Becky Mercuri’s fabulous Great American Hot Dog Book. Frankly I’m not sure that many people will be able to discern the difference between the Sonoran hot dogs at BK’s and El Guero Canelo. The law of primacy (being first) in learning posits that information learned first creates such a strong, almost unshakable impression that it’s difficult to unlearn incorrect information. I’ve long believed there’s a law of primacy in eating, too. The first truly great pizza you ever had, for example, often sets the standard by which you’ll measure all other pizzas. The very first Sonoran hot dog we had was at El Guero Canelo so it would be interesting to see how pervasive the law of primacy would be and whether or not my contention would hold true. Similar to its neighbor, BK Carne Asada & Hot Dogs is tailored for alfresco dining, a semi open-air restaurant in which the dining room is a concrete slab covered by a canopy which provides shade to protect diners from the onslaught of Tucson’s scalding heat and monsoon showers. 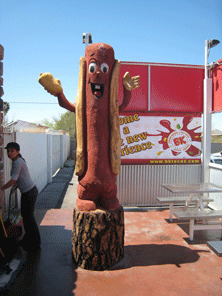 An anthropomorphic smiling hot dog, the restaurant’s mascot “greets” you as you walk in. The menu is strategically positioned directly above the order counter. It’s a menu dominated by Mexican fast foods: tacos, caramelos (similar to quesadillas), tortas, burros and of course, the Sonoran hot dog. The menu includes several variations on the simple taco: carne asada, pollo, pastor, frijole, cabeza, borrego, fish and taco. As you place your order, take a gander at the kitchen where a number of industrious people are engaged in the behind the scenes action that often goes unappreciated: chopping meat, grating cheese, flipping tortillas on the comal, preparing salsa. Place your order and in a manner of minutes you’ll be called to a stainless steel cart to pick up your hot dogs. BK’s rendition of the Sonoran hot dog is, at first glance, a prototype of the standard. Frankly by mere glance alone, we couldn’t tell the difference between BK’s and the hot dog at El Guero Canelo’s. The difference is in the tasting. Similar to El Guero Canelo’s rendition, BK’s doesn’t use a conventional split-top roll. 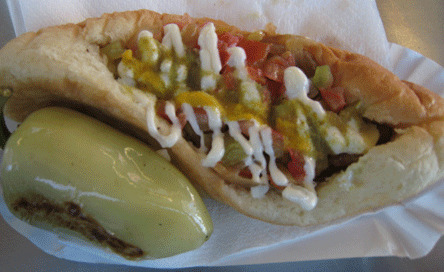 Instead, a bolillo-style Mexican bread roll seems almost hallowed out to serve as a repository for a treasure trove of ingredients: pinto beans topped by the grilled, bacon-wrapped dog then diced red onions, chopped tomatoes, salsa verde and finally an embellishment of mustard and mayonnaise decoratively criss-crossing atop it all. BK’s Sonoran-style hot dog is fantastic! Perhaps if it had been the first of its genre we had sampled, it might be the standard-setter by which we will forever judge Sonoran-style hot dogs, but the law of primacy prevailed. Unlike the Food Wars judges, we preferred El Guero Canelo’s version of this Tucson favorite, but the margin of preference wasn’t so significant that we wouldn’t return to BK’s. In the end, the two differentiating factors were the slightly better grilled flavor and just slightly less soggy (from steaming) but sweeter buns at El Guero Canelo. Both rate among the very best hot dogs we’ve ever had anywhere. Because carne asada precedes hot dogs on BK’s marquee, we had to try a trio of tacos engorged with carne asada. 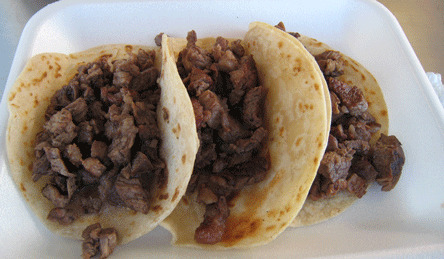 The carne is sliced into smaller than bite-sized pieces and is nestled in warm corn tortillas. Nary a hint of sinew or excess fat could be found on the carne asada, a very good sign. These terrific tacos would be reason enough to visit BK’s. BK’s serves more than 10,000 Sonoran-style hot dogs a week. You can count on contributing to that total with every visit.